The sweet sciences of boxing might seem to focus on landing punches, but the soul of the sport is in the feet. Fast, accurate footwork in the ring is needed to dodge opponents and deliver knockouts. Wearing the right boxing shoes are a must if you want to “float like a butterfly and sting like a bee.” Whether you’re new to the sport or an experienced pugilist, we’re here to help you find the best boxing shoes to ensure you get the best out of every bought. Selecting the right shoes will not only improve your performance in the ring but will also help protect your health. Boxing shoes help prevent a variety of injuries including ankle turns and plantar fasciitis. 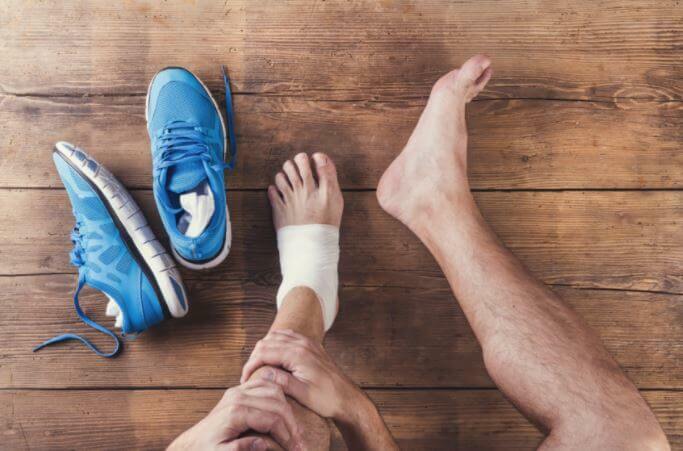 Basketball shoes, indoor soccer shoes and other types may be good for their sport, but don’t provide the type of support and swiftness your feet need in the ring. If you’re just starting to learn about boxing, you might be reluctant to purchase a pair of boxing shoes right away. Can’t ybou initially just use a pair of good running shoes or something similar? In most cases, using non-boxing footwear in the ring isn’t a good idea. Only good quality combat sport shoes will protect your feet and ankles from the specific demands of footwork. Boxers want to stay on their feet at all times. To hit the canvas is to lose the flight. Good boxing shoes immensely help improve floor grip. The surface of the ring is very smooth. During a workout or match, the ring floor can become even slicker due to sweat, water and even blood. Not that you likely would, but you should absolutely avoid boxing in bare feet. You’re very likely to slip and fall. While tennis shoes provide improved grip, they don’t provide the same level of ankle support as a boxing shoe. The grip provided by boxing shoes provides more leverage for landing punches and moving of feet. A boxers overall balance will no doubt improve. Plus, ankles and feet will be protected from injuries. The secret to a great grip lies in the sole. Boxing shoes have either a thin or medium-thick sole. This flexible sole improves “toe grip.” A thinner, less rigid sole helps your foot connect with the ground which improves balance, speed and all-around movement. It’s widely accepted that pivoting is a vital boxing skill. For instance, you’ll want to turn your front foot inward for lead hooks. Also, you want to pivot your back foot for straight rights. The right boxing shoes help improve pivoting ability. Ultimately, improved pivoting helps increase punching power and distance. Regular sports shoes can actually interfere with the ability to pivot. The traction of a non-boxing shoe is made to grip from the outside. This can hold your foot down to the canvas too much and actually prevent proper movement. The unique structure of a boxing shoe grips the canvas while still allowing your foot to rotate. Boxing involves a lot of side-to-side motions. Regular shoes don’t offer enough support for lateral movement. Boxing shoes are designed to protect your ankle from injury. 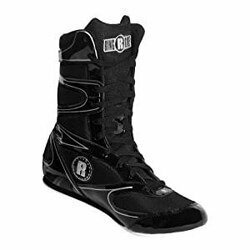 While high top boxing shoes offer the most protection, even low top boxing shoes improve safety when moving in quick, jerky motions. Bouncing and moving in the boxing ring can be difficult on your feet. The sole of the shoe reduces ring stress. The mid-sole is going to absorb most of the stress for the foot, so you’ll want a solid cushion. At the same time, the sole can’t be too thick. You want your foot to feel firmly planted against the ground. This provides a solid foundation for throwing powerful punches. The two most common materials are soft leather and suede. Synthetic is also an option, although not as comfortable or durable as leather, shoes made with synthetic materials are often the cheapest option. Ideally buy something lightweight and durable. Check for breathable mesh panels on the sides of the shoes. This will help your feet stay dry and comfortable. 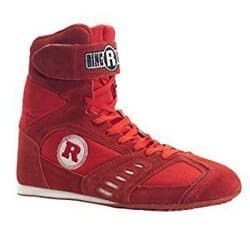 Boxing shoes have either low top, mid cut or high top. This provides support for the quick sideways footwork required of boxers. 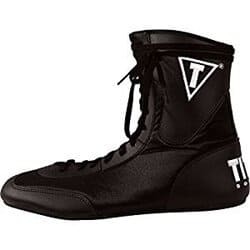 Low top boxing shoes provide the most mobility while high top designs give you complete ankle and shin support. Properly fitting laces are key. You want the shoe to fit securely. Laces provide a snug fit without rubbing against your skin. Zippers, buttons and other fasteners can irritate your skin. Most boxing shoes will have strap lacing similar to any other shoe, but this traditional look isn’t the only option. You can also find shoes with straps or a combination of straps and laces. These modern designs make for quicker lacing and unlacing. You’ll want straps if you simply hate spending the time to lace up your boots, otherwise, you’ll probably want laces. 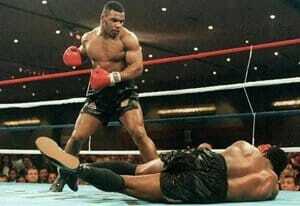 We can talk about boxing footwork allday but nothing beats seeing some in action. Check out this video featuring some of the Greatest Boxing Footwork in History. It’s an informative and fun way to understand exactly how strong and flexible a shoe needs to be. 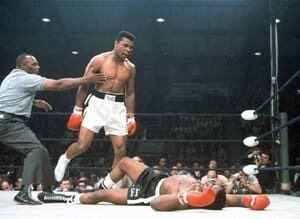 Watch how the greatest boxer of all time uses his footwork to make boxing an art. These are some of the most “invisible” boots on the market. Lightweight and flexible, they feel more like padded socks than athletic shoes. But don’t let their thinness fool you. The Reebok Boot provides plenty of protection with a padded ankle and synthetic leather construction. The high top shoes fit snugly with the help of an ankle strap and long laces. In fact, the laces are really long, which can be a bit cumbersome. You’ll likely want to double-wrap the laces. This technique can actually provide additional ankle support. One drawback we found with these shoes involves the sole construction. While most of the shoe is stitched together, the sole is glued on. With glue, the toe grip has an increased likelihood of snagging and becoming damaged. Overall, this is a great choice for beginners. The extra ankle support helps prevent ankle injuries, which are one of the most common problems new boxers encounter. Plus, the price is low enough that a new boxer doesn’t have to break the bank in order to step into the ring. The TITLE Speed Flex mid boxing shoes fit as snug as a glove. Unfortunately, part of this secure fit is due to a relatively complicated lacing system. The best practice involves pulling out the top two laces, putting the boot on your foot and then re-lacing the shoe. While lacing can be a hassle, once the show is on there’s a lot to like. The fit is snug, secure and comfortable. The mid-length top protects your ankle while still allowing for quick pivots. These are light shoes which don’t tire your feet after long periods of wear. The shoe is made from synthetic leather, which isn’t as durable or pliable as real leather. However, these shoes are still very comfortable. The inside lining provides a cushion while also allowing for air to travel in and out. Watch the length when ordering. Sizing can run small. You might want to order one size larger than what you typically wear. Fortunately, TITLE has an easy return policy if you need a replacement. This low top shoe has a striking, bold design which instantly grabs the eye. With a sleek, transparent mesh this shoe will keep your feet cool even during long training sessions. The synthetic leather reinforcements in the toe and heel add extra protection to your foot’s most vulnerable spots. The entire upper of the shoe is one piece. The unique adiZero outsole has excellent grip plus helps boost your speed whilst at the same time allowing you to rotate and move around freely in the ring. The TORSION Technology Midsole strikes a great balance between durability and grip too, making these a good choice for any boxer. With both a unique design and unique features, the Ringside Power stand out from the competition. A grooved rubber sole adds stability in the ring. Plus, a reinforced tip helps you pivot. These help increase your mobility and balance in the ring. The Ringside Power is easy to slip on and off. The hook-and-loop ankle strap helps create a secure fit. Plus, the breathable mesh and suede construction allow for plenty of airflow which helps keep your feet cool and comfortable. Unfortunately, the bottom of the shoe does have some issues in some cases. Although the sole is both sewn and glued on, the stitches are a bit loose. With consistent use over a long period of time the sole of the shoe could potentially fall off. This one is a great choice if you want to add stability and balance without sacrificing comfort. But the lack of sufficient stitching in the sole could be an issue after heavy use. In a word, these boots are cool. 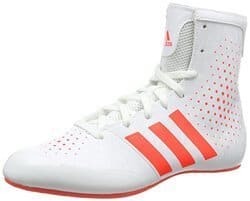 They have a classic ADIDAS design with old-school, reddish-orange stripes and matching colored sole. They look at home in the ring or even just as footwear for around town. The one-piece quarter panels have open mesh inner lining which allows for breathability without sacrificing support. Plus, the microfiber synthetic leather construction is lightweight with a soft feel. Inside the is a full-length EVA midsole. You’ll have enough cushion to protect your foot, but you’ll still be able to grip the ground with accuracy. The midsole has a slightly raised heel to help you stay in a natural stance. The rubber outsole has pivot circles to support flexibility and movement. 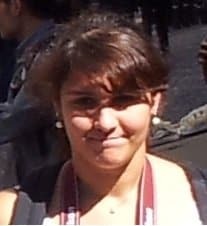 Overall, a perfect blend of research and development to deliver this superior end product. At first glance, you’ll likely notice the modern, almost understated design of this shoe. 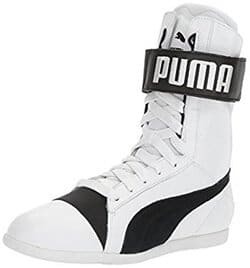 The Puma Eskiva stylish high top boxing shoes for women are white with a stylish dash of black. But it’s the inside of these shoes which really stands out. Puma’s entire Eskiva line features a unique design which promotes flexibility. The leather construction allows the shoe to contour your foot’s specific shape. For a shoe, the Eskiva fits like a glove. These are lace-up with an upper strap. Shoes with laces can take some time to slip on and off, but laces generally provide a more secure fit than zippers. While obviously female boxers can about more than style, the unique design of the eskiva is a big selling point here. Beyond just style, the design offers a snug fit which conforms to your foot like practically no other shoe can. 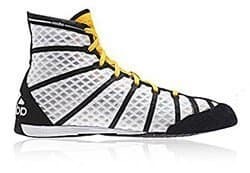 ADIDAS has many advantages you’d expect to see from a large manufacturer, and is able to offer some of the best boxing shoes on the market due to its experience in the field. Hence, we now have the Pro Bout, which is made of the softest and most comfortable natural leather, and is scientifically designed to hug your foot and provide support, speed and flexibility. This boot provides a grip which rivals the powers of Spider-Man. The split sole bottom has a rubber forefront and extra support heel, both of which help support precision pivots. The Torison sole exterior is lightweight, durable and non-marking. 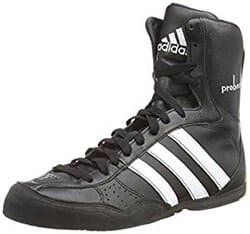 If you’re looking for a wide pivot range and amazing gripping power, the ADIDAS Pro Bout is a great choice. 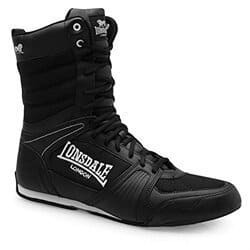 Tall and bold, the Lonsdale Contender high top boxing boots have a serious, downright intimidating look. These are tall cut with full padding and a quilted ankle collar. Extra traction is provided through a gripped outsole. These boots have full laces. 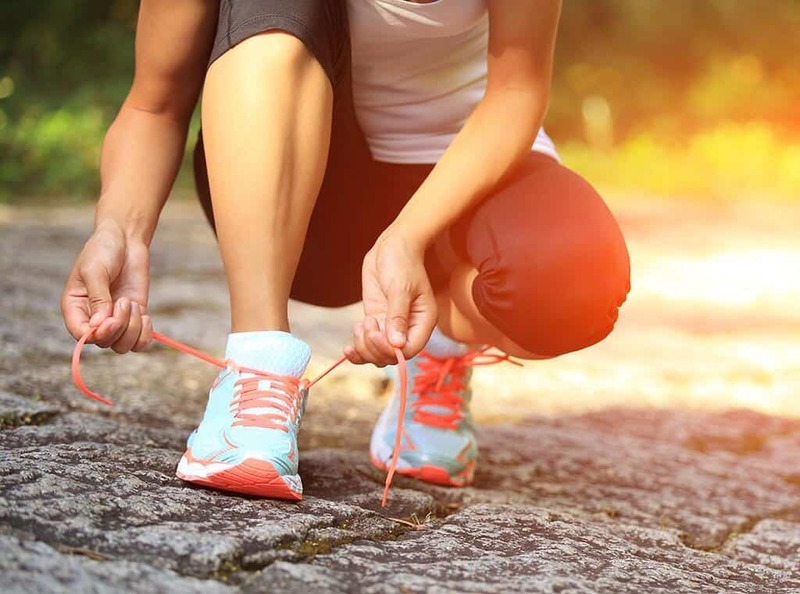 While you’ll get a secure fit, lacing up can be a bit of a hassle. They might not be the best choice if you frequently remove your boots during training. The Contenders are made from a few different types of material. The upper part is made from leather and synthetic. The inner sole is made from synthetic. Overall this one is durable and clearly built to last. Style meets performance with Ringside’s Undefeated High Top. Designed for boxing, MMA and also reviewed as one of the best wrestling shoes for 2017, these help improve stability and all-around athleticism. They’re also stylish enough to wear casually. These are very good-looking with a patent leather vinyl finish. The high top ankle provides support while also adding to the distinct look. The shoe has a nylon mesh pattern for increased breathability. The sole is made of rubber. You’ll have secure footing even on the slickest boxing services. Not only does the rubber sole help you stay balanced but it also helps protect from falls. Breathable and comfortable, these are a good choice for anyone dedicated to long and frequent combat sports sessions. 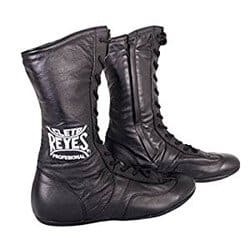 Cleto Reyes is not one of the most widely known names in the world of boxing, but these leather lace-ups rival the quality of much bigger brands. Durable and stylish, these boots have a lot to offer – although they’re also a bit on the expensive side. Made from leather and suede, these boots are resistant to wear and tear. Plus, the materials shape to your feet in just one or two training sessions. They have a rounded tip with laces on the front and a zipper along the side. While the zipper makes putting on and taking off easier, it can also press into the side of your leg. Most dedicated boxing professionals prefer to avoid a zipper. But there’s still a lot to like about these boxing shoes, especially for beginners. The high-top ankle support prevents ankle twists and other injuries common to beginners. Plus, the leather construction is both flexible and long-lasting. Now to decide which of the 10 is the greatest? All of the ones listed above have more advantages than disadvantages, which is why they all made this shortlist in the first place. 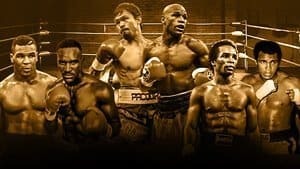 Part of finding the best boxing shoes isn’t simply splashing out on the most expensive or popular pair, but more to do with understanding your needs. 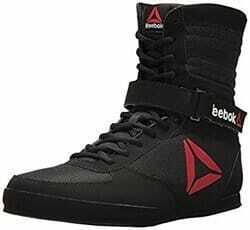 If you’re a beginner, we recommend the Reebok Boot. Although the synthetic leather doesn’t conform to your foot as well as leather, it has excellent ankle support. Beginning boxers run a high risk of ankle injuries, so the extra padding of this shoe provides additional security. Women boxers will prefer the Puma Eskiva. With a modern, bold design this is a shoe you can also wear out of the ring. In the ring, it offers a precision fit and strong grip. But if you’re looking for the absolute best boxing shoe overall, we think the ADIDAS Pro Bout delivers the biggest knockout punch. The Pro Bout has a rubber front and plenty of heel support, which protects your ankle while also allowing for precision pivots. The leather upper construction is durable and breathable. Finally, the non-marking Adiwear sole provides plenty of traction in the ring. In our opinion, this is the best all-around boxing shoe.